We have a couple big events happening within the next two days. First? 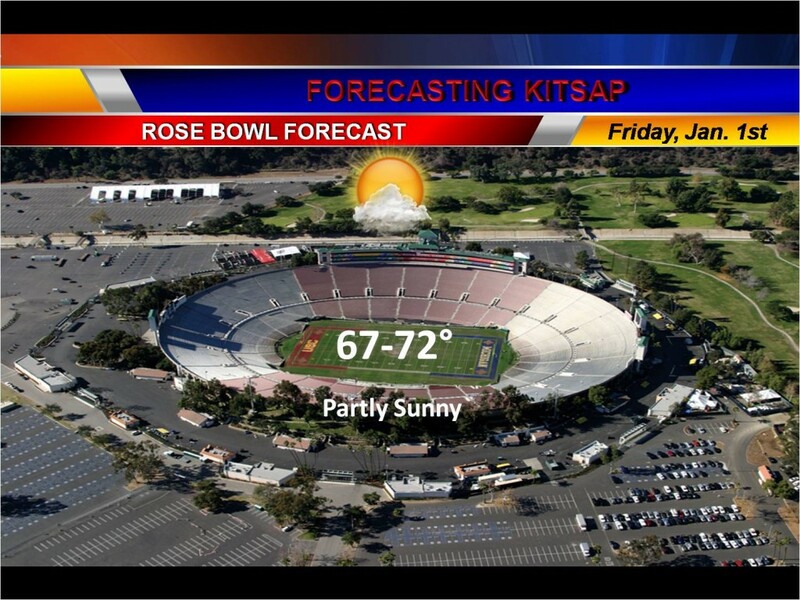 The Rose Bowl! 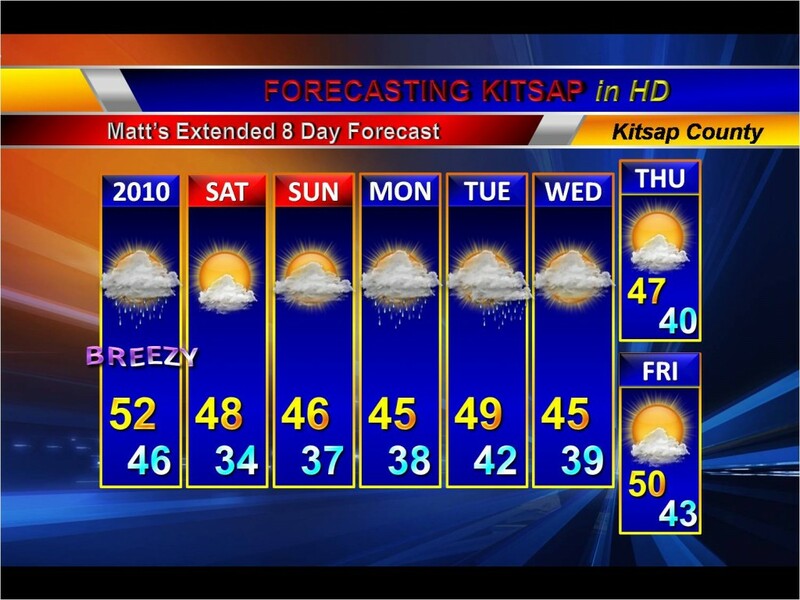 And I think we need a special forecast for the parade because the South Kitsap marching band will be preforming in it! Luckily for them, it will be MUCH more pleasant down there than up here. Ahhh doesn’t that sound great? Kitsap Sun reporter Chris Henry, who is accompanying the band in CA, writes in the March to the Roses Blog: “a look back in time shows it has only rained nine out of 120 times on parade day: 1895, 1899, 1906, 1910, 1916, 1922, 1934, 1937, and 1955. While rain has, in some years, delayed the start of the parade, it has never canceled the event.” This year it will be beautiful! Good luck, guys! We have some excitement of our own here in the Northwest as a “Blue Moon” is forecast to make an appearance tonight…well, for those able to see some clearing 😉 A blue moon is defined as the second full moon in a single month (the first occurring December 2nd), or as the third full moon in a season that has four full moons. Of course, the saying “once in a blue moon” signifies a rare event, blue moons aren’t as rare, occurring once every 2 1/2 years or so. 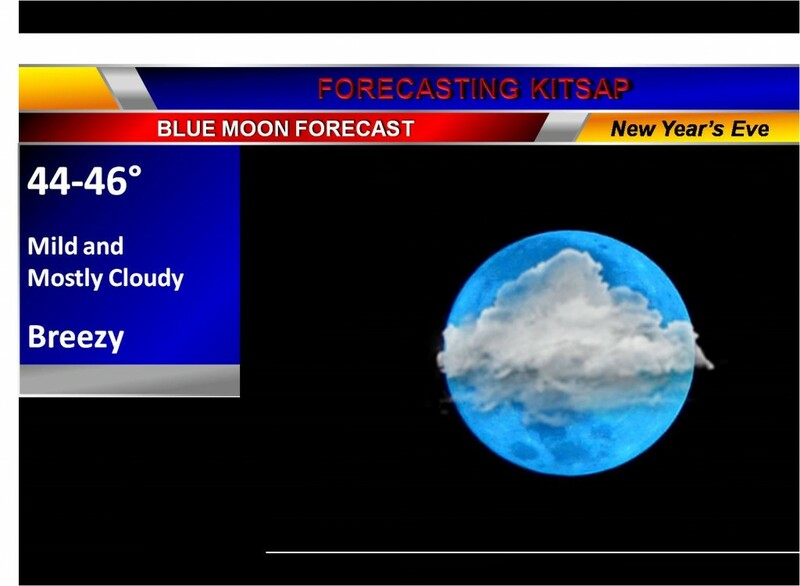 A New Year’s Eve blue moon, however, is a little more rare considering we haven’t had one since 1990. There will be areas of clearing by 1 AM or so, primarily in the central sound, so a little after midnight we should get a glimpse at the very least. 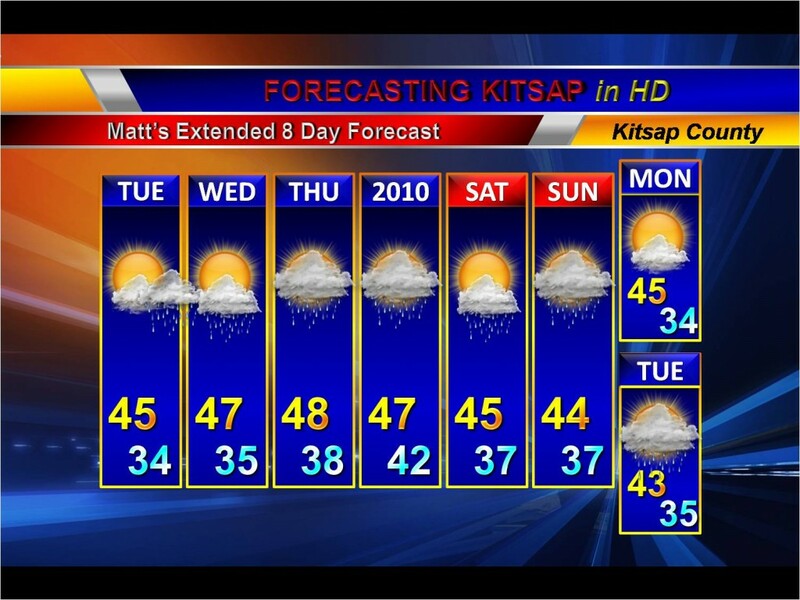 And lastly, the extended forecast. In the short term, I have nothing new to forecast, but the long term is still a bit erratic. So many model runs have shown so many outcomes, so take it for what it’s worth. I haven’t seen model consistency this bad since…well, I’ve NEVER seen model consistency this bad! For now, have a wonderful evening and be safe out there! Here’s to a remarkable New Year…2010! 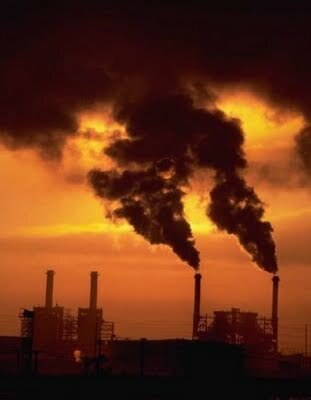 Up next in the (unfortunate) politically tumultuous climate change battle? Population control. Click here to see the video report from AccuWeather.com. Get ready for a stormy New Years holiday! Moderate rain is headed for Western WA and OR along with some breezy winds (nothing too out of the ordinary…I’d say 20-30 mph) through the first part of the weekend. We dry out midday Saturday through the first couple days of the new week of the new year until more heavy rain and wind return by mid week. Bummer. So close. In fact, we were in a much better situation to receive snow this evening than two weeks ago. Dewpoints and temperatures are in check, we are just lacking one major thing: precip intensity. It is looking very bleak on the radar at the moment. If we had started this thing off with heavy precip, it would have been snow and likely stayed snow until late tonight. But it never ended up coming in as intense. The Shelton area has been seeing a wintry mix, though. Their precip was heavier than ours is now. I guess now we have to wait for January to deliver the goods! POSSIBLY STARTING AS SNOW WITH A DUSTING POSSIBLE. This situation is certainly intriguing, primarily because we are starting out the way Portland did before the snow hit: 37 degrees with a dewpoint below freezing. Still no reports of snow in the Shelton area…in fact, moderate rain and fog is being reported with a temp of 34 degrees, but light snow has been reported around Chehalis. I’ve been tracking a storm system approaching the area for the past several hours, and I’m thinking we could eke out a few snowflakes with this. I’m very hesitant to say much more than this after my “3rd degree burn” of a forecast two weeks ago, but reports of sticking, moderate snow are escalating in the Portland/Vancouver area, despite temperatures in the mid 30s. Why? The very low dewpoints. The dewpoint at Bremerton National Airport is 30 degrees with a current temp (as of 2:35 pm) of 37 degrees. That’s low enough to squeeze out some snow. That along with moderately heavy precip and cooling temps this evening increase our chances. Stay tuned to this blog post for updates…! There’s Rain, and then There’s FREEZING Rain! It’s great to be back! After a long, 14 hour road trip from Salt Lake City to Silverdale, we made it home safely. Of course, me being the weather addicted nerd I am, I wasted no time logging on to my computer and checking the latest forecast discussions from the NWS (I swear…weather is so addicting, if my family members caught whiff of a Weather Anonymous group, I’d be doomed). “WE WILL NEED TO MONITOR THE HOOD CANAL ZONE OVERNIGHT IN CASE A FREEZING RAIN ADVISORY IS NEEDED”. Freezing Rain Advisory, huh? I have never seen that before, though I know there have been ice storms here in the past. We have rain in the forecast all the time, but not FREEZING rain! 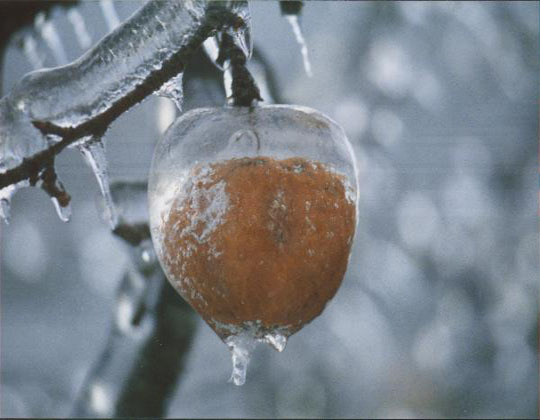 Freezing rain, in simple terms, is rain that falls when temperatures are below freezing. But how can that happen? Typically, it will start out as snow in the upper levels of the atmosphere until it enters a layer of warmer air, causing it to melt and produce plain ol’ rain. If there’s enough cold air trapped at the surface, however, this rain then becomes supercooled (the state at which a liquid or gas is below its freezing point without it becoming a solid) and then freezes whatever it touches (below freezing) on impact. So you can imagine, freezing rain really isn’t all that fun. It falls like normal rain, but when it goes through the “supercooling” phase at the surface, it causes many problems. Ice glazes the roadways or any objects left outside that are below freezing. 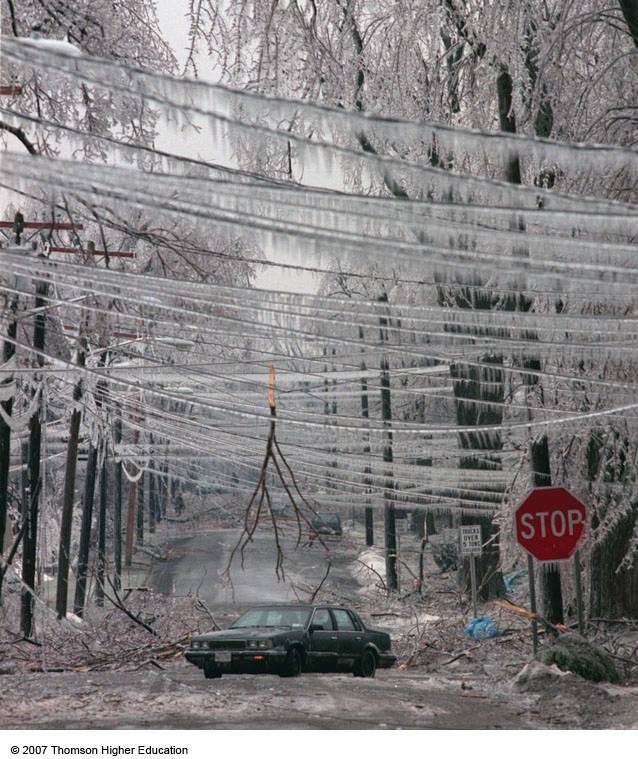 Ice storms look cool, but they are downright dangerous and messy. Well, I have a list of things to do today. The extended forecast is below, so take a look and plan your week accordingly! I realize this is a weather blog. But from time to time, I feel it necessary to defend myself on personal issues in my life that are being publicly attacked. I am a proud member of the Church of Jesus Christ of Latter-day Saints. I will be serving a full-time mission for my church this spring, something I have been looking forward to for quite some time. I don’t believe everyone will be receptive to what I have to say, but when someone calls the church I love and respect “the church of Satan”, which is what Delilah ignorantly and publicly stated in the aforementioned Kitsap Sun article, I can’t keep quiet. Last time I checked, the definition of Christianity is: “The religion based on the life and teachings of Jesus Christ”. And how “The Church of JESUS CHRIST of Latter-day Saints” even remotely resonates as a Satanic, cult-like church is beyond me. Spending just one hour in an LDS church service is all anyone would need to know this is not “The Church of Satan”. The only churches I believe founded by Satan are those that promote hatred. Simple as that. Another note: Ms. Luke’s hypocritical actions of taking her children out of a school teaching fundamental LEADERSHIP values, NOT Mormon values, simply because the author is Mormon is shocking. What difference is there between that and taking your child out of a school because the professor is black? Or because the teacher is teaching a book by a black author? Or maybe the Kitsap Sun should fire me because I’m a Mormon reporting the weather? Religious intolerance and racism are very similar, and in this situation religious prejudice rings especially true. My intent is not to convert my readers to Mormonism. Heavens no. I feel my personal duty is to stand up for the church I love and support when it is being attacked, especially by a prominent member of my community. That is my job. These are my thoughts. And I’m stickin’ to ’em. 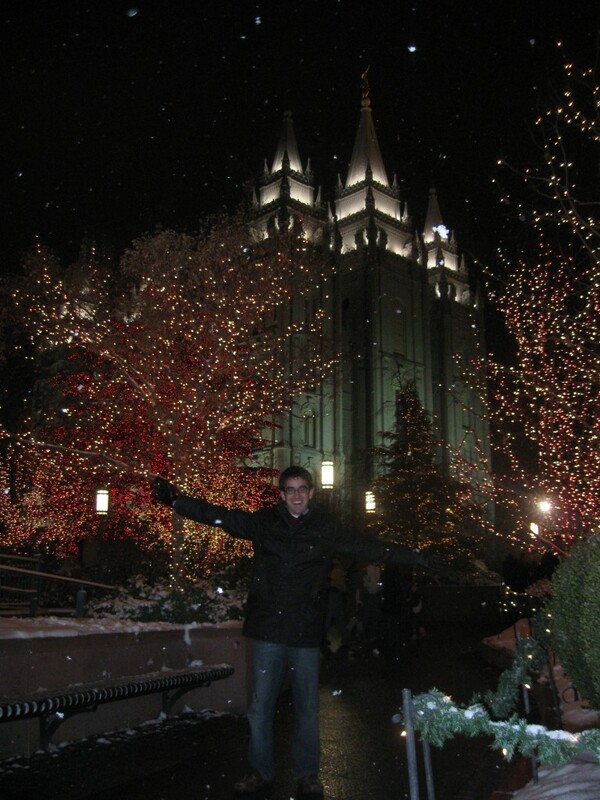 VIDEO/PHOTOS: Christmas in Temple Square! Well, it’s Christmas Eve and the family is about to go walk around the city. 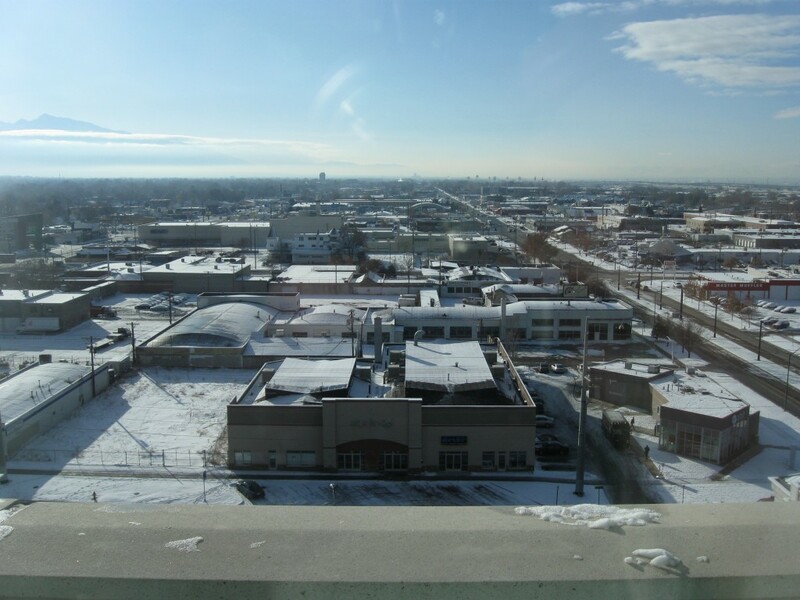 It is currently 18 degrees and the sun is shining brightly here after a snowy couple of days. I’m always amazed at how flat Salt Lake City is! Back home, the weather is slowly clearing up after a cloudy/foggy couple of days. Temperatures will also warm slightly, but will remain pretty chilly in the upper 30s/low 40s. Our next chance of precip arrives by the weekend. 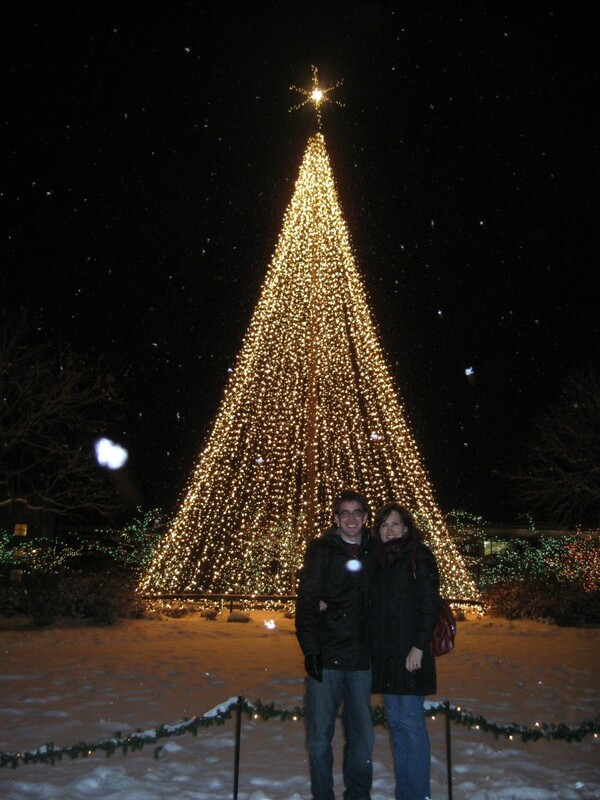 Yesterday we took a walk around Temple Square and couldn’t have timed it any better. 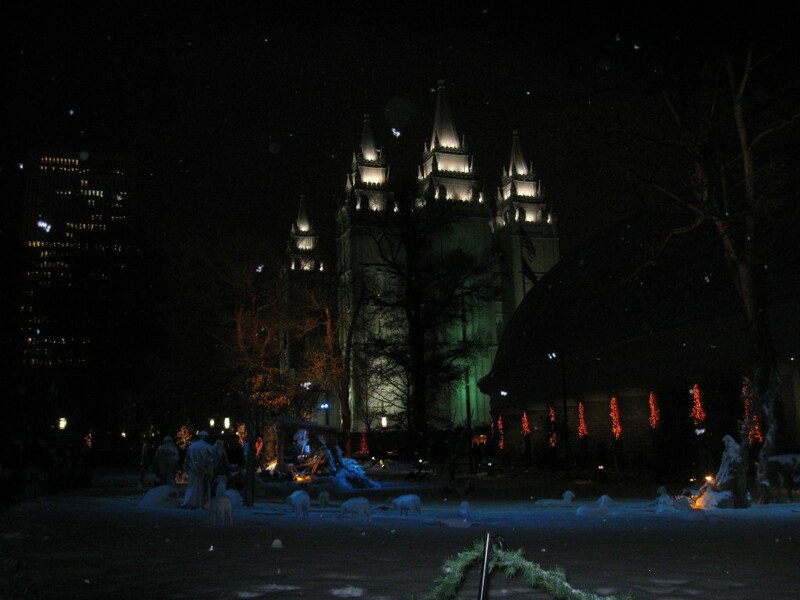 Big, fluffy flakes were falling all around us as we approached a snowy Nativity scene accompanied by music from the Mormon Tabernacle Choir playing behind us. We had such a great time! I hope all of you are enjoying this season, home or not. 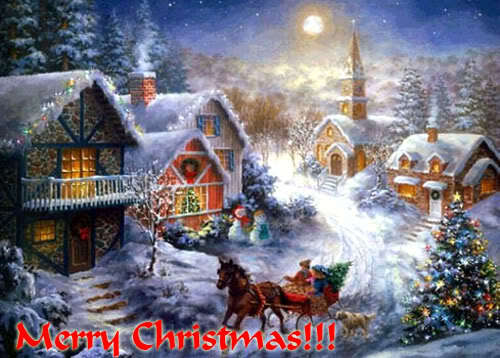 Have a very Merry Christmas everyone! My regular blogging habits will resume on Monday, December 28th. Whew! It’s a crazy one out there in Silverdale. Personally, shopping, especially in clothing stores, is one of the most painful experiences of my life. I think slicing my thumb open and getting stitches a couple years ago was a little more thrilling than trotting around Macy’s looking for the best deals. Excluding my dad, I am the only boy in the family with three sisters and a mother who love clothes shopping. I will never understand, but perhaps I’m not meant to. Anyway, today is the first official day of winter!…and the shortest day of the year. Starting tomorrow, we’ll be holding on to daylight longer every day until June 21st. Wouldn’t some snow add a little bit of sentimental value? For some folks in Western WA, classical sloppy Northwest snow is looking like a pretty good possibility tonight into tomorrow morning as a convergence zone forms to our north, but for the rest of us rain will continue to taper off through the evening. Some modified cold air from the north is spilling into the region, thus dropping snow levels and temperatures from late tonight through Christmas Eve. This will be a dry cold so snow showers don’t look likely, but I would be surprised if a modified “arctic boundary” set off some surprise snow showers. We remain pretty chilly and dry through the holiday week/weekend with the next threat of precipitation arriving Monday. 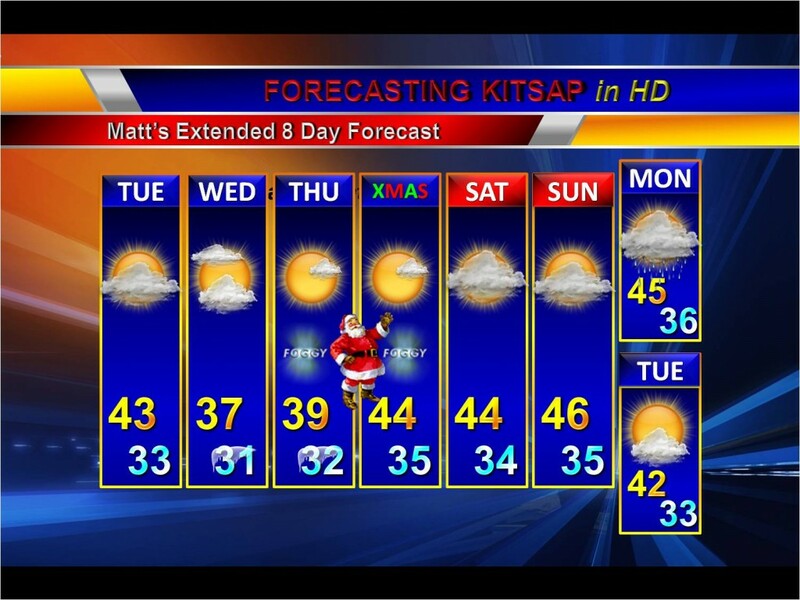 While Christmas Eve/Day look dry and mostly sunny, there will be periods of fog/low cloud cover. I actually wouldn’t be surprised to see some of those low clouds stubbornly hold on to the area all day. This would mean much colder daytime highs and a much gloomier scene outside. I’ll keep tabs on this. I’m leaving early tomorrow for Salt Lake City where a snowstorm that could dump as much as 10” is expected by late tomorrow night, so as exciting as that sounds, I hope we can make it down there before the bulk of the precip arrives! It’s been awhile since I’ve blogged…this week has been a very busy and, at times, stressful one for me but finally things are slowing down and I’m getting ready for a family Christmas trip to Salt Lake City, UT. 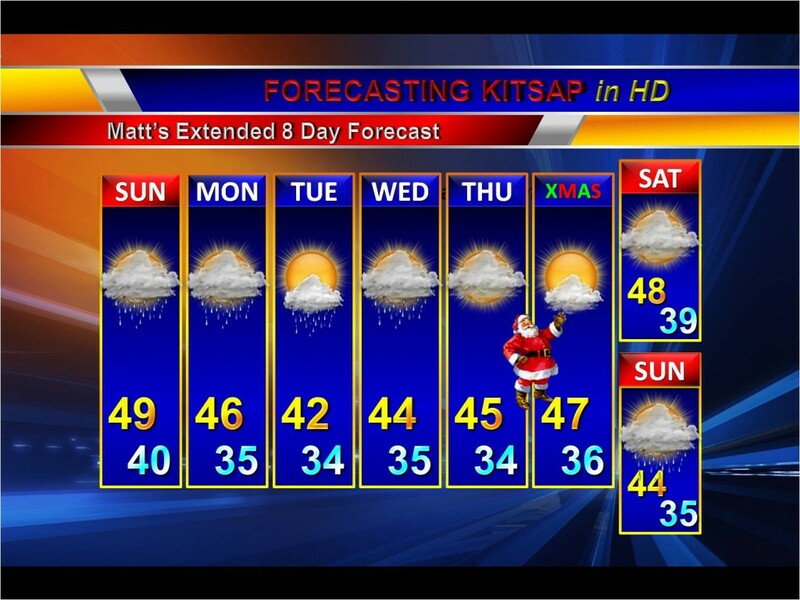 The latest forecasting trends indicate a white Christmas for me, but how about here in Western Washington? Sunday, December 27th–Saturday January 2nd: This week looks, and has been looking, pretty interesting. Obviously this is so far out in long range land that to say anything for certain would be a big mistake, but from what I’ve observed if we’re going to have any snow chances during winter break, it’d be during the second half. It appears colder (and even, at times, moist) weather regime will make an appearance after Christmas. The atmosphere has been and will likely be in a “La Nina-like” state until mid January, so seeing series of colder weather systems affecting the region at this time makes sense. To sum it up, the first half of winter break will feature coolish/wet periods but overall it’s what we’ve grown to expect here in the Northwest. The second half of winter break offers the best chance at seeing some of the white stuff as the cold and wet weather continues. #1. Order early and ship out early. #2. Do not rely on expedited services such as last minute Next Day Air and Second Day Air to get your packages to you on time. Not only are they WAY more expensive but a Vendor that you order from can promise one thing, but unexpected delays in processing and weather can easily lead to another reality all together. Last year comes to easily to mind. #3. Talk with your delivery person. Communicate to them in advance large bulky or perishable items coming in and the location where you would like the items left if you will not be home or they do not require a signature. #4. Have items shipped to your daytime work place if at all possible. Not only does this alleviate any peeking or guessing by the kids, but you know expensive, temperature sensitive items are not sitting outside on your porch exposed to the elements for hours at a time. #5. Remember that while delivery drivers will try to accommodate you whenever possible, they are still under certain restrictions by their employers with either time allowances or specific routes they need to adhere to per company policy or risk losing their jobs. Be patient. Start times in the mornings are constantly being adjusted and moved to later times to accommodate air deliveries coming into the center. #7. Be safe. Delivery drivers and their helpers spend long hours out on their routes during the month of December. It is not uncommon for many of them to be out on the roads until very late at night in weather conditions that are adverse and makes it difficult for other drivers to spot them. Company policy dictates that they wear a specific uniform in dark colors which also does not help. Keep pets and children away from the trucks and out of the streets. Especially during snowy times. And most of all BE NICE and know that they are doing their best to get your packages to you during the day and return home safely to their own families at night. It is the season of Peace and Forgiveness. Bah Humbug! : Old Man Winter is Really Mr. Scrooge? By request, I’ll be doing a Winter Break forecast later this week! Watch out for that! I should’ve known light rain/drizzle at 10 am this morning was a bad sign. Of course, me being the snow lover I am, I held out hope. Alas, it appears we are just too darn mild for snow at this time and many of us will end this cold blast without seeing a dramatic snow event. The Brinnon/Hoodsport area is pretty chilly still with temperatures around 33/34 degrees, meaning a rain/snow mix or very wet snow will continue through the night until all the cold air is scoured out of the area. I expect, for most of the Kitsap Peninsula, a rain/snow mix at best…maybe a spurt of snow in the heavier showers, but overall we’re getting just about the most rotten deal (this is coming from a snow enthusiast…I have my biases 😉 ). Isn’t it just frustrating we wasted a whole week of record setting cold—and not even just “record setting”, but “coldest string of temperatures in recorded history!”—under sunny skies. Grrrr…I need to take my mind off something other than weather tonight. Hope shouldn’t be thrown out the window…yet. While a heavy mist/drizzle is making things wet and messy outside, the real blob of precip has yet to arrive. Temperatures are between 34-36 degrees right now, so until the heavier stuff comes (which will be moreso around 2-3) expect cloudy skies and mist. This has bust potential written all over it, though. Like I said, if we had gotten colder last night our chances of having flurries right now instead of light rain would have been high. Those who live close to the Canal are still set to receive snow this afternoon. I think the chances of a good coating away from the Canal, however, are diminishing. We’ll see. It really was all dependent on how soon the southerly winds would pick up and how much cold air we could bottle up from last night. For snow lovers you have the cold on your side right now with temperatures just a little above freezing. You also have the wind on your side because right now…nada. When we start seeing a southerly wind, you can say goodbye to long-lasting snow. That will scour us out real quick. We also have a good batch of precipitation heading our way, which is obviously a key ingredient for snow. However, I don’t think we got cold enough last night. I would’ve felt a little better about our chances of longer lasting snowfall all across the peninsula if temperatures dropped below 30 last night. Where we stand now, it won’t take much to boost those temperatures to the lethal “rain area”. So precipitation should start to move into the area by noon or so with the best chances for accumulating snow near the Hood Canal and with elevation. Those in downtown Bremerton/Silverdale or on Bainbridge Island probably won’t get much of anything…maybe a trace. But climb up a few hundred feet (like on Ridgetop) and you’ll likely see the white stuff stick. It won’t last long, however, as everything should turn to mush by Tuesday morning.